Does each box contain an assortment of colors? No, each box contains only one color. The color selection is random and it is not possible for you to choose which color you will receive. Use these Royal Paper RP147 3 1/4" plastic sword food picks to add a classic, decorative touch to your sandwiches, appetizers, and samples. With their sturdy, durable construction and tip point, you can spear sliders, stuffed mushrooms, or mini meatballs for easy-to-grab individual portions. Plus, each pick's 3 1/4" length will allow your guests to easily hold their serving. Each box contains one of five brilliant and eye-catching colors: red, white, yellow, pink, or green. You will only receive one box with picks of one random color. The blunt hilt ends add a decorative touch while the traditional design accentuates your foods. Use these picks to hold sandwiches together or garnish drinks for a professional presentation that is both functional and pleasing! Once your guest has finished their meal or drink, each pick is disposable so you can simply throw it away. These food picks are a great way to stop "double dipping" and make for great presentation when we put our party platters and small items. Cute accessory for any cocktail event. 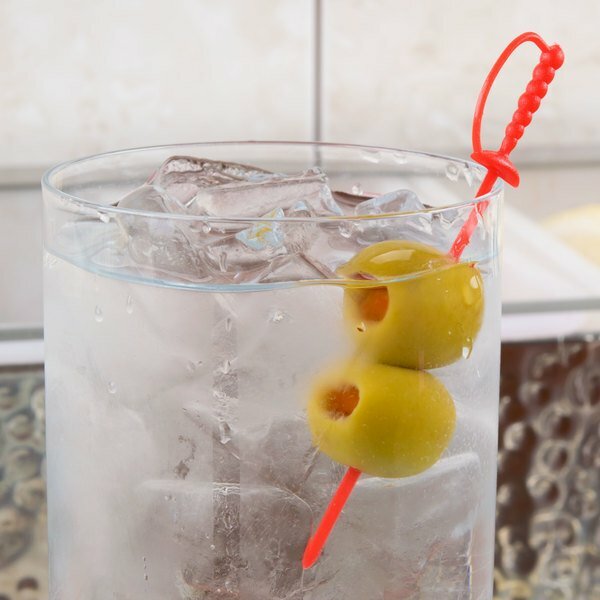 Works well with olives and cherries, Sits nicely on top of a rim of a 9oz clear plastic cup. We love the fact they come in just about any color you need to match party theme. They are always good quality very few broken or bent. Your standard cocktail departs. Slices through cherrys or other fruit with ease for a cute topping. Product is a little flimsy and can snap with a little pressure so we reccomend being careful. We really like these toothpicks for decorating our baked goods. The only gripe is that the color is random, it would be nice to be able to choose which color you receive. A gray and pink sword but no blue? Seems like an odd choice, but we were happy to use these. They are sturdy and don't break too easily, plus have the added advantage of being easy to grip. These swords are great. Note however that while they are listed as assorted colors, when ordered the color will be chosen for you and the box will be all one color and not assorted colors. 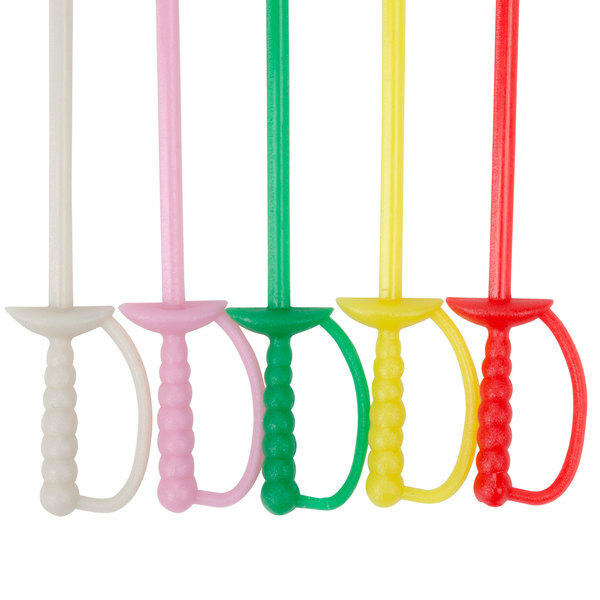 These plastic swords measure 3 1/4” long. They’re sturdy, yet bendable, but don’t break or snap in half easily! Purchasing these on Webstaurant gives you the best bang for your buck! Highly recommend! A must have for your fruits when making bloody Mary’s, Kiddie cocktails, serving Coronas, etc. Reasonably priced and Annoying when you don’t have them so stock up! You’ll Use em! 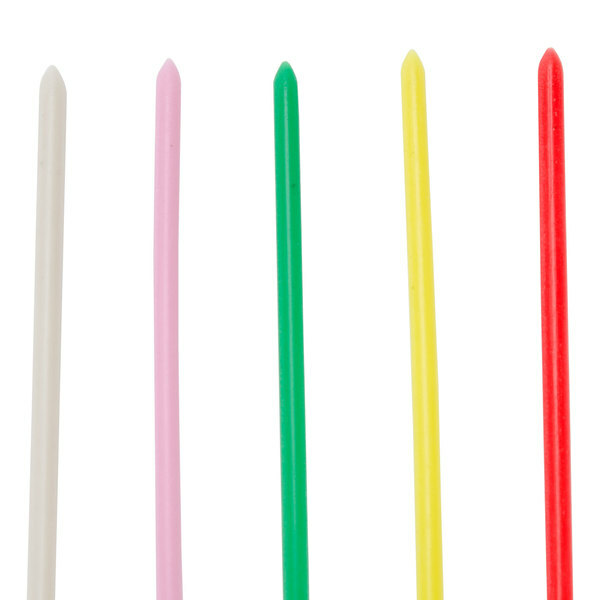 plastic colored food picks. I like the different colors that are offered. i always buy the bulk boxes to save a few bucks. I gave 4 stars because the fruit seems to slid off easier than picks i have bought in the past. I would still recommend. Great picks for putting on beverages. You can place fruit through them and make for a great presentation if to buy more you will save money. 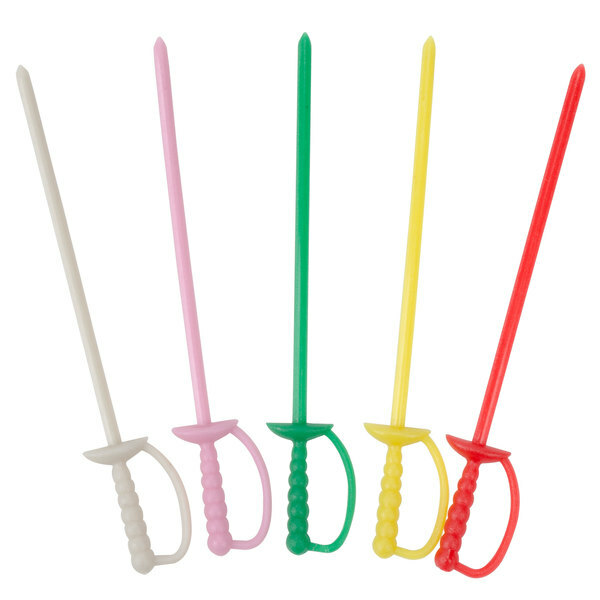 The Royal Paper RP147 3 1/4" Plastic Sword Colored Food Picks are excellent. They are perfect for drinks or even snacks. The quality is very good and the price is reasonable. Definitely recommend! Sword fight! We don't do a lot of garnishes on picks but these are great for the occasional martini and the kitchen uses them to differentiate burgers when we have a ton going out. We use these at our bar in our restaurant for olives and other garnishes and they are a hit! They are so easy to use and are such a great price. 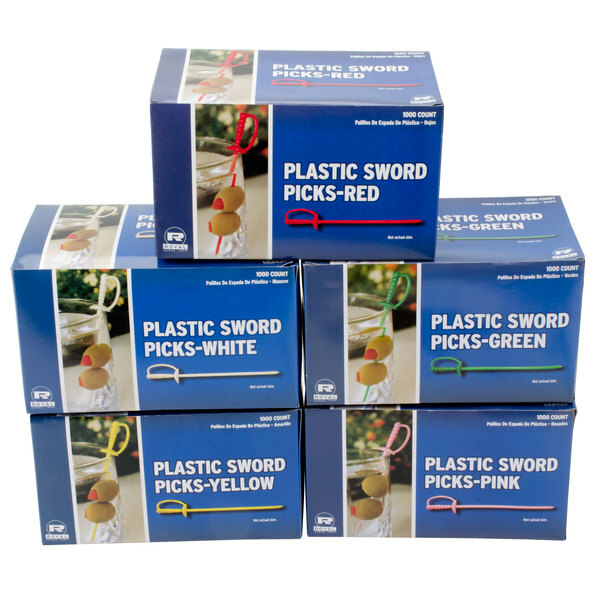 we have these sword picks in all sorts of colors and use them for different drink garnishes as well as to hold sandwiches and burgers together on the plate. I tend to use these more often then most other food picks, yes I do find it humorous when people start talking like a pirate. Well mixed box of sword shaped picks. Very cute and festive. No production problems with my batch. Would recommend for trays of small foods or sandwiches.